If you pick the name of a photographer that you know or know of and do a Google search, you will likely find a website with their images on it. It can be as simple as that. Some sites, however, are more conducive to viewing great images than others. 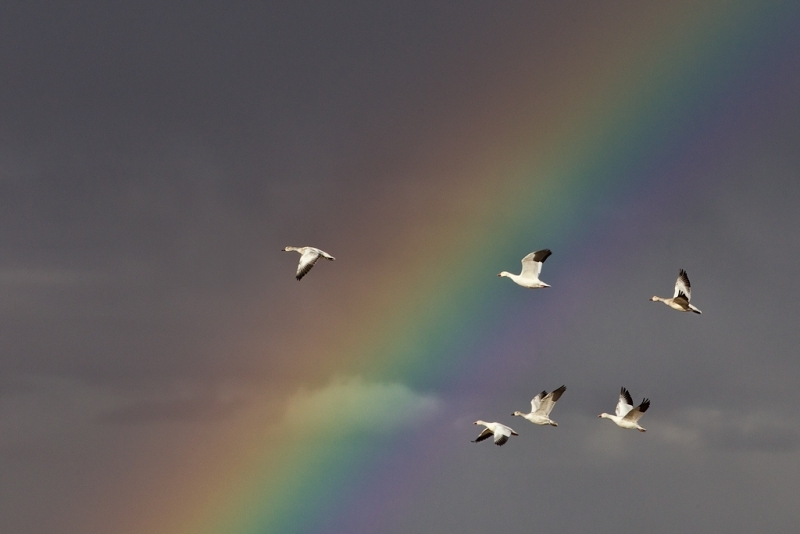 Many–especially bird and wildlife photographers–have websites that serve as stock photography sites that are designed to facilitate image sales. You might have to search through thousands of images to find a few gems. Others have poorly designed web sites that feature outstanding images that are hard to enjoy because of the surroundings. Prompted by Melissa’s question I scouted around a bit and came up with a few of my many favorites. Those are listed below in no particular order. But do not be fooled or limited by my list: there are tons of great images out there waiting to inspire you; all that you need to do is find them! 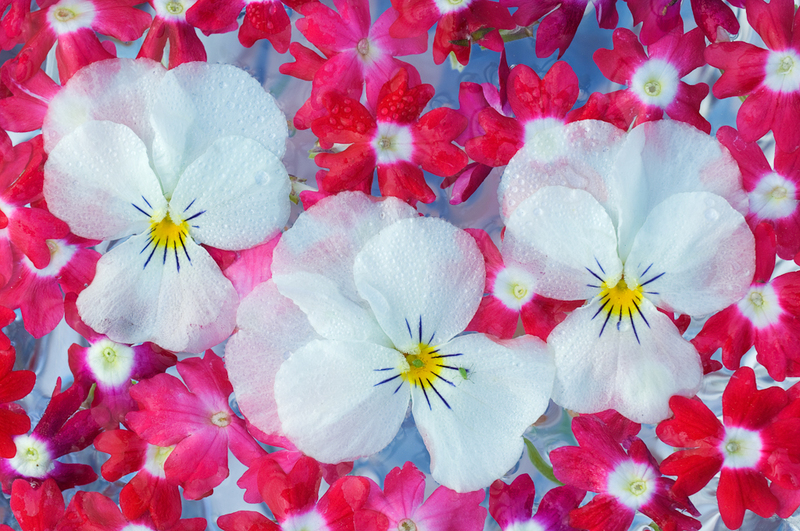 Flowers floating on water. Image copyright and courtesy of John Shaw. The soft-spoken John Shaw is both a colleague and a friend. You can find a link to his galleries here. His “Variety” gallery contains a diversified collection of great images. Recently I have been perusing his Antarctica and Japan galleries as inspiration for my upcoming trips. John was an early inspiration and though he does fewer birds and flowers now than he used to, most every one of his images features the clean look that has served as the basis for my style for nearly three decades now. In addition, the man is a master of composition and image design and understands and uses light as well as anyone. Thanks John! 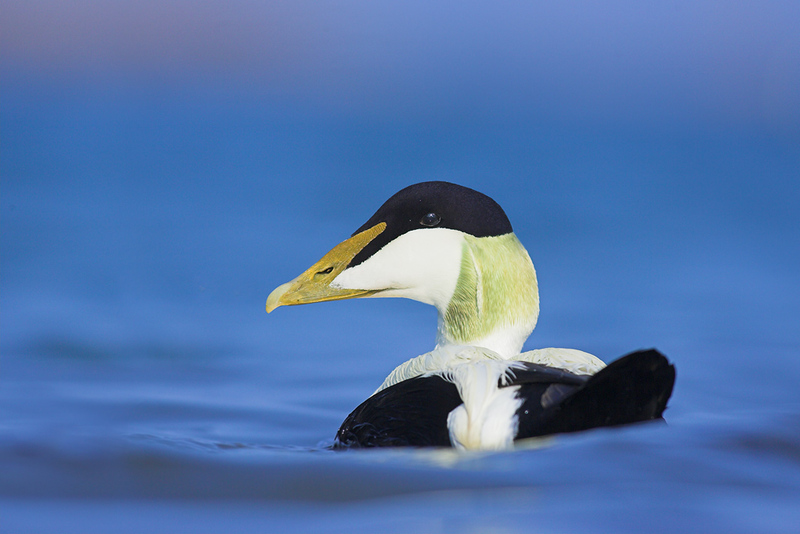 Water level Common Eider drake. Image copyright and courtesy of Ben Hall. Ben is a young British professional photographer who is not very well known on this side of the pond. For shame. You can see some of his best work here: There are lots of absolutely killer images in every gallery. My favorites are Animal Portraits, Animals in Motion, and Landscapes. He has some amazing duck images and some superb blurred tree photos. Ben’s galleries are representative of the dozens if not hundreds of extremely skilled but largely unheralded pro photographers who share their work on the web. If you find any gems like Ben let me know via e-mail; I am always looking to learn and be inspired. Velvet-fronted Nuthatch. Image copyright and courtesy of BPN member Kiran Poonacha. 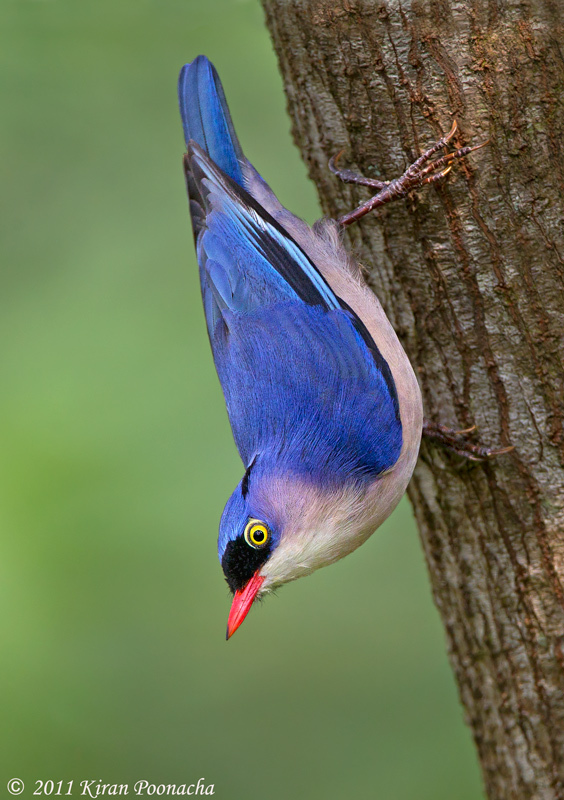 Kiran is a skilled nature photographer from India. You can see his post of this image in BPN’s Avian forum here. I spend lots of time in the Avian and the Out-of-the-Box forums at BPN. And on occasion I visit the Macro and Flora, the Wildlife, and the Landscapes, Cityscapes, and Travel forums. On average two or three of every twenty images in every forum have contest winning potential. I have spent thousands of hours on BPN critiquing the images of both members and participants (though I tend to concentrate on the work posted by our members). If you think that thousands of hours is an exaggeration consider the fact that I have posted about 850 of my images and made an additional 20,000 comments, most of those to images posted by others. Most of my comments are lengthy and often include reposts. My point is that by looking at and considering the work of others I am always learning and often being inspired. Image copyright and courtesy of Clemens van der Werf. I was asleep at the swtich (looking for my 77mm circular polarizer) when Clemens created this one…. Clemens is a both an IPT client and a good friend. He is representative of the many folks who have improved their skills to professional levels by attending multiple IPTs, by applying what they have learned, and by working very hard. (This list also includes L. F. Van Landingham, Alejandro Furman, Jean-Luc Vaillant, Jim Heupel, Patrick Sparkman, and James Fuller among others.) You can see Clemens’ work here. Hold your cursor over the word “Portfolio” and choose a gallery from the drop-down menu. Be warned: except for Clemens’ Travel, Golden Retrievers, and Sailing galleries all of his collections are IPT advertisements. You will quickly see that though Clemens has been inspired by my style he often uses the principles that he has learned to create work that is new and different. And in doing so he often inspires his mentor. Andy Rouse is different; he often gets his cameras and lenses in spots where others have feared to go. He has an eye for dramatic light, new perspectives, and unique image designs. With many BBC-honored images he is one of the five prestigious judges in the BIRDS AS ART 1st International Bird Photography Competition. You can learn more about Andy here and check out many of his great images by clicking on the Gallery Navigation links here. 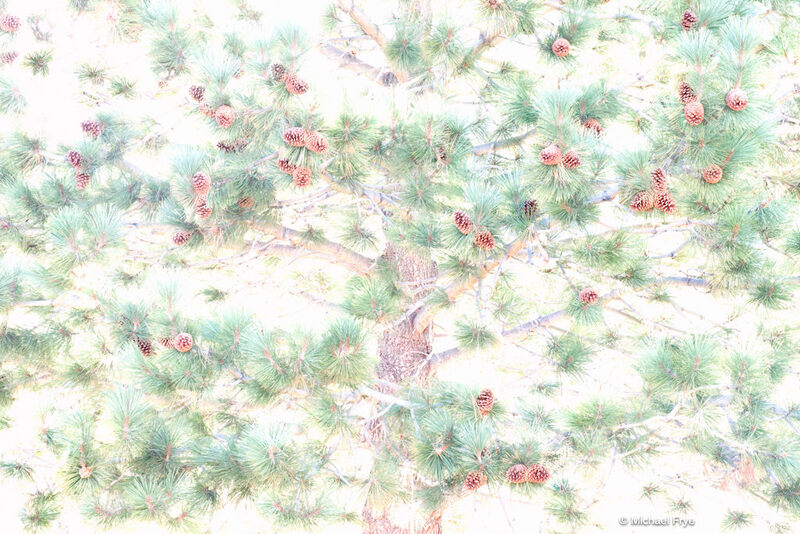 Jeffrey Pine, Lundy Canyon, Inyo National Forest, CA. Image copyright and courtesy of Michael Frye. Michael is a friend and professional photographer specializing in landscapes and nature. You can see some of his best work here. My favorite Michael Frye portfolios are New Work, Yosemite, Eastern Sierra, and High Key. Be sure to read his “Artist’s Statement” here; he has lots of interesting things to say about photography and light. As Michael photographs few if any birds you might be wondering why I am including him here; photography is about light and personal vision and image design and those concepts are not restricted to a single genre of our craft or our art. One of the things that I like best about visiting Michael’s site is that each image is accompanied by an educational caption. “The Last Supper.” Amazingly, this scene was photographed underwater. Yes, underwater. Image copyright and courtesy of Howard Schatz. Howard Schatz has been a hero of mine since the day I met him and was introduced to his work. To learn about his remarkable accomplishments in photography, click here. Click here to visit his portfolio page and then prepare to be stunned by the diversity of subject matter and techniques, by the colors and shapes, and by Howard’s great vision, creativity, and execution. Todd Gustafson: galleries. Todd is one of the premier safari photographers of our time; his fast reflexes and quick eye allow him to create images of animals and birds in action that others can only dream of. Jon Conforth: images. You’ve likely never heard of this natural history generalist; his landscapes are the strength of his collection. Tim Fitzharris (website) and Rod Planck (galleries) both inspired me early on. Both have moved away from wildlife and birds towards landscapes in recent years. For both Art Wolfe (print gallery) and Frans Lanting (fine art prints) no introductory remarks are needed. Denise Ippolito (home page). An informational blog packed with soft colors, flowers and birds, filters and effects, Photoshop, and unbridled creativity. Carl R Sams II & Jean Stoick (home page) of “Stranger in the Woods” fame are a professional photographer team who sold countless prints at art shows over the past decades. All of the eagles in Carl’s spectacular gallery were made when he came to Homer as my guest years ago. George Lepp (home page). Though know for his technical expertise you will find plenty of inspiration in George’s images. Paul Mckenzie (website). Paul (along with wife Paveena) are aspiring professionals who travel extensively. Paul is equally skilled above and below the water. You will marvel at the images in his galleries and on his blog. An internet connection and a Google search will bring you countless treasures. Those treasures can thrill you, motivate you, educate you, and inspire you. Any of these names will work: Joe and Mary Ann McDonald, Stephen Johnson, Gary Braasch, James Shadle, Darrell Gulin, James Nachtwey, David Doubilet, Walter Iooss, Tony Sweet, Moose Peterson, Anup Shah, Tom Mangelsen, Lewis Kemper, Jack Dykinga, Jim Zipp, Eric Meola, Brutus Östling, Robert O’Toole, Jari Peltomäki, Jim Brandenburg, Paul Bowen, Norbert Rosing, Jennifer, Wu, Adam Jones, the late Fritz Pölking, Rick Sammon, and Bence Máté to name a few. This list is nowhere near complete; rest assured that I have left out the names of some very talented friends and some of the world’s best and best known nature photographers. Please feel free leave a comment suggesting a name (along with a website if you wish) of any folks whose work inspires you. And let us know if you have been inspired by any of those on my list. Thanks a stack to all who have used the B&H product links to purchase their gear as a thank you for all the free information that we bring you on the Blog and in the Bulletins. Before you purchase anything be sure to check out the advice in our Shopper’s Guide. I heard about Carl Warner while watching the news about a month ago. He creates and photographs phenomenal landscapes made entirely out of food! My passion is nature photography but I can’t help but find such work inspirational. Yup, a bunch of great folks on all of your lists. The bottom line is, there are a ton of great photographers out there! Thanks for sharing some new ones for me Art. Thanks Artie for all the inspiration and information you have given us these many years. It always amazes me, that you can do, all that you do. Artie, you sure answered my question, and in spades. Thanks so much for your time and thoughtfulness. I do spend a lot of time looking at the work of other photographers, I find that it is crucial in developing my eye. I know and admire the artistry of many of the heavies you list, particularly Dykinga, Mangelsen, Lanting, Shaw, Fitzharris, Frye, Peterson. I discovered Rouse through one of your posts and love him. I get library books on different photographers like these out of the library all the time and pore over them (have Rouse’s Living Landscapes out right now). I also go back to Eliot Porter and Ernst Haas from time to time, love them. There are also painters like Robert Bateman that are inspiring. BPN’s fora of course have been a huge help and inspiration, I check in with all of them regularly. I much admire the work of the moderators (e.g. Denise’s work, which really helps me think outside the box) as well as many of the members, such as Marina Scarr, Grace Scalzo, Arash Hazeghi, Ofer Levy and Kiran Poonacha, to name just a few. I also love Matthew Studebaker’s photographs for how clean and elegant they are. An up and comer that you should check out is Floris van Bruegel. I think he has a really special eye. See his site at http://www.artinnaturephotography.com/. And of course I regularly check in with your blog. I’ll never forget the day I discovered your work, before I became obsessed with bird photography. It was an entirely new way of looking at birds that I hadn’t seen before, and I was completely enchanted. I am very grateful for your gift, and your generosity in sharing your knowledge. BPN is like a virtual classroom for me! M.
I have found many of the photographers you listed to be very inspirational, especially the work of John Shaw. And over the last year or so Denise Ippolito’s creative renderings continue to inspire me to try new techniques with my own imagery. I am also quite impressed with the work of wildlife photographer Andy Rouse. For some of the most amazing insect photos I’ve seen, try http://www.alexanderwild.com. Alex Wild is both an insect photographer and professional entomologist. His images are excellent, and the captions add deep and knowledgeable background as to the behaviors and species photographed. What an impressive, inspiring list. Thanks for adding to my folder of worthwhile sites to visit on a regular basis to keep the creative juices flowing. Artie, thanks for adding many new names to a list you gave me many years ago. I literally spend hours studying Kah’s images – they glow for me like a beacon. Artie, Thanks for the sites as I, too, am always looking to see images from a great variety of colleagues. A couple of sites to suggest: Guy Edwardes, a British photographer of birds, wildlife, and landscapes, at http://www.guyedwardes.com. And the BAA bulletins, Blog, and BPN are an ONGOING source of inspiration to us all !! !